This book is dedicated to the critique of old certainties about culture and place. 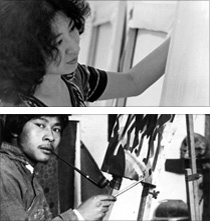 It discusses Yun Gee and Li-lan’s lives in relation to the contemporary issues of transnationalism and cosmopolitanism: kinds of belonging that Homi Bhabha calls being in “the in-between.” In contrast to the more frequent discussion of emigre and biracial artist’s art works as resulting from their hybrid lives, Yun Gee and Li-lan require a different model in order to account for the unity of vision that emerges from their experiences of passage. In a thorough examination of their lives and works, this book argues for that vision.